With the country still reeling from the devastation wrought by Yolanda, the people are facing yet another disaster – the calamity of soaring prices. 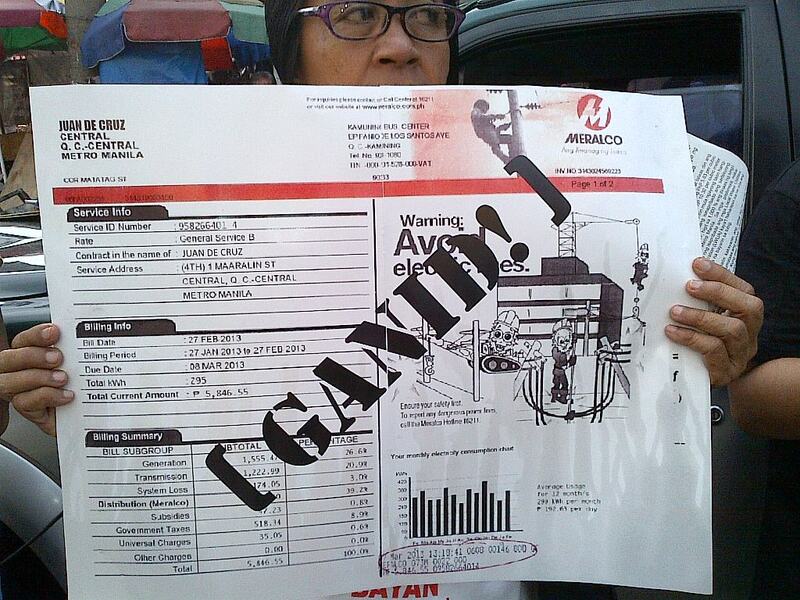 People ask: Are the oil companies and Meralco (Manila Electric Co.) that heartless and greedy? Alas, this is the cruel reality of neoliberal economics, of deregulation and privatization. The market is regarded as greater than the people, and government allows the heartless and greedy to reign. Starting December, oil firms implemented a record-high increase in LPG prices. 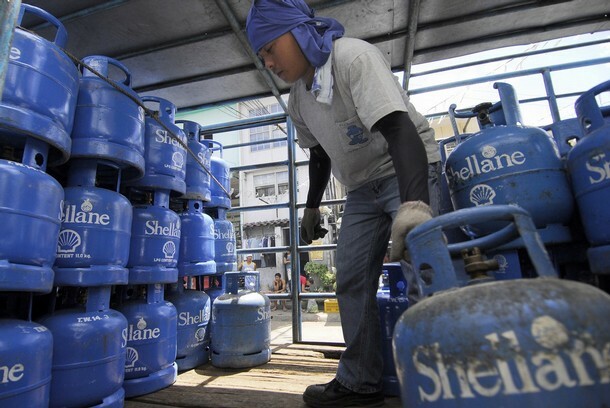 Petron hiked its LPG price by P14.30 per kilogram (kg); Liquigaz, P13; and Solane, P11. These translate to an increase of P121 to P157 for an 11-kg LPG tank commonly used by households. Then the oil companies jacked up the price of other petroleum products. Diesel rose by P1.35 per liter; kerosene, P1.20; and gasoline, P0.35. This week, oil firms implemented another round of oil price hikes with diesel rising by 30 centavos. Prior to the latest increases, the price of diesel has already jumped by P4.08 per liter this year and gasoline by P2.04, based on the Department of Energy’s (DOE) monitoring. And of course, Meralco said that it will implement a hefty increase in power rates this month. The distribution utility said that the hike in its generation charge could reach P3.44 per kilowatt-hour (kWh) but it will be implemented in installments to mitigate the impact. The Energy Regulatory Commissioned (ERC) allowed Meralco to collect the increase in three tranches. That would be P2 in December, P1 in February and P0.44 in March. But generation is just one component of the electricity bill that will rise. Also increasing is the transmission charge, which will go up by P0.04 per kWh. Taxes (value-added tax and local franchise tax), system loss charge, lifeline rate subsidy and others, which are a percentage of generation and transmission costs, will also add another P0.67 per kWh in the Meralco bill. Thus, the actual rate hike to be felt by consumers would be P2.41 per kWh in December, P1.21 in February and P0.54 in March. However, while the sudden impact of a one-time huge rate hike will be mitigated, consumers will end up paying more. According to the ERC, Meralco may charge its customers an interest on the entire deferred amount or the so-called carrying cost. And even at a staggered basis, the rate hike would still be tremendous. A 200-kWh household, for instance, will see its Meralco bill jump by P482 this month. The increase in power bill creates a domino effect on the prices of other basic goods and commodities. Contrary to propaganda of government and big business, wages are not the main driver of price hikes but electricity cost. The Employers Confederation of the Philippines (Ecop) said that power accounts for as much as 40% of production cost. With the big Meralco rate hike, Ecop also warned of higher prices. Of course, Meralco’s customers could not choose not to buy electricity from Meralco. They have no choice. Petilla’s remarks sum up government’s indifference to the plight of consumers, which the Aquino administration has repeatedly displayed in its almost four years in power. By themselves, the record increases in petroleum prices and electricity bills are already oppressive. But what makes them doubly onerous is that the country is still recovering from Yolanda’s onslaught. Government has not even fully accounted the total number of dead, which now stands at 5,796, according to the latest official count. Note that this is not the first time that these same companies displayed total disregard of public interest and welfare. Last year, amid the torrential, Ondoy-like rains that poured over Metro Manila, oil companies and Meralco also increased prices. Ironically, the country is supposed to be under a state of national calamity as declared by President Benigno Aquino III through Proclamation No. 682. But the string of record price hikes shows that big business can act with impunity. The reason is that the price control aspect of the proclamation is limited by law and the overall deregulation policy of government. Under Republic Act (RA) 10623 (which amended RA 7581 or the Price Act), the price of LPG may be controlled under a state of calamity but only for 15 days. The price of LPG and other petroleum products is deregulated under RA 8479 or the Oil Deregulation Law. Electricity rates are also not included among the basic necessities that government may control during a state of calamity. Through RA 9136 or the Electric Power Industry Reform Act (Epira), government deregulated the setting of the generation charge of Meralco and other distribution utilities. Epira also deregulated rate-setting through the wholesale electricity spot market (Wesm). To pave the way for the deregulation of the oil and power industries, government privatized Petron Corp. and the National Power Corp. (Napocor). The Oil Deregulation Law and Epira trump the Price Act and any proclamation of a state of calamity. Apparently for government, not even the strongest typhoon ever recorded could change that. Both policies were imposed on the country by foreign creditors led by the World Bank and the Asian Development Bank (ADB). The huge Meralco rate hike is a perfect example of how privatization, deregulation and lack of state control over key sectors burden the consumers. Had government not relinquished effective control over energy development to profit-oriented private business, the public would have been spared from the impending hefty increase in power rates. The supposed tight energy supply is only artificial. It could have been prevented if the maintenance shutdown of the country’s energy sources and power plants were effectively controlled by government. But because it relies too heavily on private business, government has no handle in determining the maintenance schedule of power plants in a way that ensures energy security and public interest. For instance, the maintenance shutdown of Malampaya started on Nov. 11, the same date that President Aquino put the country under a state of calamity. Energy officials already knew then that it will trigger a big spike in power rates. At that time, energy supply in Luzon was already tight due to a series of maintenance shutdowns of major power plants. Meralco, in fact, already implemented a large increase in power rates in November when it jacked up its rates by P1.24 per kWh. The utility giant said that the maintenance shutdown of several big power plants was the main factor behind the rate hike. These were Unit 2 of Malaya power plant in Rizal (Dec. 2012 to Oct.); Unit 2 of Pagbilao plant in Quezon (Aug. to Nov.); Unit 1 of Sual plant in Pangasinan (Sep. to Oct.); and Sta. Rita Module 20 (Oct. 23-28). In addition, a number of power plants were also on forced outage. These were San Lorenzo Module 60 (May to Mar. 16, 2014); Unit 1 of Masinloc plant in Zambales (Sep. 25-28); Unit 2 of Calaca plant in Batangas (Sep. 29 to Oct. 1); Quezon Power (Oct. 5-6); and Unit 1 of Sual plant in Pangasinan (Oct. 22-26). But instead of ensuring that Malampaya will remain online, especially after Yolanda, government stood idly as the source of 40% of Luzon’s power needs was cut off. The shutdown of Malampaya and of the other power plants, said Meralco, forced its suppliers Sta. Rita and San Lorenzo power plants to use more expensive fuel. The utility giant claimed that it was also compelled to buy more from the Wesm where electricity is being sold at a higher price. Meralco said that its exposure to Wesm will increase from less than 5% to 12% due to the Malampaya shutdown. Note, however, that the private investors who control Meralco are the same investors that control the power plants as well as the traders in the Wesm. The 1,000-megawatt (MW) Sta. Rita and the 500-MW San Lorenzo plants are owned by the Lopez group, which also has a 3.9%-stake in Meralco. Power plants associated with the Lopez group also account for around 18% of the capacity registered at Wesm. The concentration of ownership over power generation and distribution, and even over the spot market, raises a valid question on the legitimacy of the power rate hikes. The same thing can be said in the case of the oil industry wherein basically just four companies lord over more than 80% of the industry. Thus, the move of the House of Representatives to investigate Meralco’s rate hike is a welcome development. Officials of the distribution utility, the power plants, and also the DOE should explain the circumstances behind the huge increase. There is certainly a need to closely look at the shutdown of Malampaya and the power plants as well to determine if the big power investors are abusing the public through their unhampered control over the energy sector.